Douglaston Golf Course, formerly North Hills Country Club, is located in Queens and is easily accessible from both the Long Island Expressway and the Grand Central Parkway. It is our most popular course and the second busiest course in NYC. This course offers a country club experience at a fraction of the cost. Forest Park Golf Course, also located in Queens, is a beautiful tree-lined course that is proclaimed the best New York City golf course by Golf Guides USA. Flushing Meadows Golf Center has a lovely 18 hole "Pitch & Putt " course that caters to golfers of all levels. This golf course has the distinction of being the only fully lighted course in NYC. This facility also contains a beautiful mini-golf course with waterfalls, bridges, and streams. It is conveniently located in Queens, a short walk from Shea Stadium and the # 7 train. Kissena Golf Course, our most recent addition, is a "must play " for the 2014 season. Fully renovated in 2010 with new bunkers, tees and extensive drainage work. Check out our new pro shop and snack bar with a beautiful fireplace. New bathrooms were also installed. Van Cortlandt Golf Course, America's oldest public golf course, is located in the Bronx and is the most accessible New York City golf course to mass transportation. The # 1 train leaves you just a short walk to the course. A complete course renovation project at Van Cortlandt was just completed in 2008. The design is that of Stephen Kay, one of the finest golf course architects in the Northeast. Van Cortlandt specializes in full service golf outings and catered events. 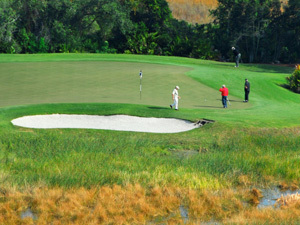 GOLFNYC is always striving to offer you the best New York City golfing experience that New York City has to offer.